Gathering information is the second step in the decision-making process, and one of the most important phases of the backcountry trip planning process. Without accurate information you can’t make informed decisions, which then erodes confidence in the overall plan. Gathering information can also be one of the most enjoyable steps to planning out your trip because this is where you get to be the curious child who asks a million questions. Clearly, some questions will be more relevant than others, but if there’s something on your mind write it down and pursue the answer until you’re satisfied. As I’ve stated in the Tahoe Trail Guide overview, it’s not my intention to be the sole source of information regarding hiking and backpacking at Lake Tahoe or thru-hiking the Tahoe Rim Trail (TRT). Rather, I want to add to the conversation and provide insight and an educated voice based on my experience of being a long-distance backpacker. Also, please note that the questions I raise in this article are what I’ve most frequently been asked since completing my 2014 thru-hike of the Tahoe Rim Trail. This list isn’t comprehensive by any means, but it’s a great starting point to begin your research and information gathering process. In the last article about planning your next backcountry trip, I stated that some goals may yield more or less information than others. Fortunately for our purposes, information related to our goal of thru-hiking the Tahoe Rim Trail is readily available from a handful of reliable sources. What resources are available for learning about thru-hiking the Tahoe Rim Trail? Are there any websites or books specifically written about hiking the Tahoe Rim Trail? Are there any local businesses or organizations that provide support for TRT hikers? Are there any former TRT thru-hikers available for interviews (online, in person, over the phone)? There are usually organizations or stewards that maintain and promote long distance trails in America. In the case of the TRT, there is the Tahoe Rim Trail Association (TRTA). The TRTA features on their website a ton of detailed information and maps regarding hiking the entire trail (as well as history, volunteer opportunities, and other information about the TRT). This would be one of the first places I would start to gather information about your backpacking trip. The second resource I’d acquire is the latest edition of Tim Hauserman’s book titled Tahoe Rim Trail: A Complete Guide for Hikers, Mountain Bikers, and Equestrians. The third resource I’d pick up is Tom Harrison’s map titled Lake Tahoe & Tahoe Rim Trail. Between these three resources, you could easily plan your trip. However, I would also consult the National Geographic Lake Tahoe Basin (803) map as well as the Lake Tahoe Basin Trail Map by Adventure Maps, Inc. It would also be in your best interest to visit the Lake Tahoe Basin Management Unit (Forest Service) as you’ll need a permit from them for backpacking through the section of the Tahoe Rim Trail that travels through Desolation Wilderness. Oh … and I’d also recommend that you keep reading this article, too! How many miles long is the Tahoe Rim Trail? How many days, on average, does it take a person to thru-hike the TRT? How many miles can an average person hike each day? What is a slow and fast pace for hiking? When I thru-hiked the TRT (2014), the total length of the trail according to the Tom Harrison Lake Tahoe & Tahoe Rim Trail map was 172 miles. The TRTA describes it as a 165-mile trail. When I thru-hiked the Appalachian Trail (AT) in 1999 I clocked the mileage at 2,120 miles, whereas the Appalachian Trail Conservancy officially acknowledges the 2,000-miler club (of thru-hikers) and, as of 2018, describes the AT as being 2,190 miles long. This variation in total mileage from year-to-year is common with long distance trails because the overseeing organizations often re-route sections to reduce impact or accommodate new land easements/ownership. Seven miles of difference isn’t too much to factor into your overall plan, as with the TRT. However, 70 miles of difference, as in the case of the AT, clearly presents additional logistical considerations. Personally, I would use 180 total miles as my working mileage for the TRT. I estimate slightly higher than the official number because there will always be bonus miles to hike along your journey. Some of the reasons include making a mistake such as choosing the wrong path at a fork in the trail, being unable to hitch a ride and having to walk into town or back to the trailhead, or deciding to hike a short off-shoot trail for a panoramic view or better campsite. As far as how many days it takes a person to thru-hike the entire TRT, that’s completely up to the individual. However, the basic formula for an average hiker’s pace = 2 miles per hour + 30 minutes per 1,000 feet of elevation gain. Then you have to include some additional time for lunch and rest periods throughout the day. For example, if the day’s hike was 14 miles long and featured 1,500 feet of elevation gain, I would calculate the time for an average hiker to complete that day to be about 9 hours. 7 hours (14miles/2mph) + 45 minutes (30 minutes for 1,000 feet + 15 minutes for 500 feet). Then, I would add another 30 minutes for a lunch break and another 45 minutes for resting and stopping to take photos or chatting with other hikers. A slow hiking pace would be less than 2mph and could be the result of inexperience, lack of athleticism, elevation gain, injury, or adverse trail and weather conditions. A fast hiking pace would be over 3mph. Although most people can easily walk 3mph around town, I would still consider this a relatively fast pace for the trail. And just to keep things in perspective, many Appalachian Trail and Pacific Crest Trail (PCT) thru-hikers can hike a sustained pace of 4mph and will often hike for more than 12 hours in a day during the summer months. Believe it or not, I’ve actually met PCT hikers who’ve completed the TRT in less than five days. To estimate how many days it would require an average hiker to thru-hike the Tahoe Rim Trail, I would start by estimating the person’s mileage per day then divide the total mileage of the trip by those miles per day. This will give you a ballpark figure from which to start. So, using the average daily mileage example of 14 miles … 180 total miles/14 miles per day = approximately 13 total days. Again, this is just a ballpark figure because some days will be shorter and some days will be longer. However, at least now you know the trip will take around two weeks, not two days or two months. What is the best time of year to attempt a thru-hike of the Tahoe Rim Trail? You can access the Tahoe Rim Trail throughout the year, but the best time to plan your backpacking trip is during the summer months when the days are longer and the weather is more favorable and predictable. Typically, people complete the TRT sometime within the 4-month window of mid-June to mid-October. One major weather-related concern to keep in mind when planning your trip, however, is the state of the snowpack from the previous winter. If the snowpack was above average, hiking before June (and sometimes before July) will probably have you hiking across long sections of snow. This means you’ll be walking across ice in the morning and slush in the afternoon. Read my article about volatile conditions and transformational snow in Tahoe during the spring for more information about this concept. A benefit of a big snow year is that you can find water late in the summer. On the other hand, if the winter preceding your trip was a low snow season, water sources may be dry by July or August. This was the situation I found myself in 2014. Tahoe experienced a drought winter prior to my hike and nearly all of the seasonal water sources were dry by the time I reached them. As a result, there were a couple of days where I hiked 20-mile sections between water sources and carried about four liters of water to accommodate the longer stretches. I know that sounds crazy, but I prefer to stay hydrated all day and dry camp at night (i.e. not near a water source). 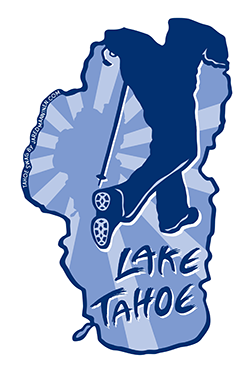 Lastly, be aware that (historically) snow has fallen in every month of the year at Lake Tahoe. It’s not the norm to experience a snowstorm in the middle of July, but it has happened. What’s the traditional route people hike the Tahoe Rim Trail? Where is the best place to start (and finish)? Should I hike the TRT in a clockwise or counterclockwise direction? Are there benefits to choosing an alternate route or direction? Are there shuttle services that drop off or pick up people from the trailheads or provide resupply deliveries? The traditional route for many thru-hikers has been to begin and end in Tahoe City, traveling in a clockwise direction. There are three reasons for this choice. The first is that there is a large parking lot at the transit center near the trailhead in Tahoe City where you can leave your vehicle (so long as you confirm it with the transit center). The second reason is that by the time you’re ready for a resupply, you’ll be close to South Lake Tahoe which is accessible by HWY 50 (Spooner Summit), NV 207 (Kingsbury Grade), SR 89 (near Luther Pass), and HWY 50 (Echo Summit). The third reason is that by hiking clockwise and ending in Tahoe City, you save the section through Desolation Wilderness for the end. Some people consider this to be the “best” part of the trail. However, more important is the idea that by the time you make it to Desolation Wilderness, in theory, you’re stronger and can cover more miles more confidently (as there are no quick ways out of Desolation Wilderness). For my thru-hike, I essentially started in Desolation Wilderness because I live down the hill from it in Meyers. I literally walked from my front door, up to Echo Summit, hopped on the TRT/PCT trailhead at Johnson Pass Road, and continued hiking around Lake Tahoe. Not only was this the coolest option for me, it was also the most convenient because I didn’t need to find parking for my vehicle or procure a ride to and from the trailhead. Thanks to the network of highways that enter the Lake Tahoe Basin, you can start and finish your hike anywhere. The main concern, however, is where to park your vehicle or whether or not you can find someone to shuttle you to and from the trailhead. The TRTA website goes into detail about this subject, so check their site regarding parking. As far as shuttling goes, I’m not aware of any business that specifically provides this service to TRT thru-hikers, but there are lots of taxis and ride sharing options at Lake Tahoe. Other than parking or the convenience or cost of travel to and from the trailhead, I don’t see any other truly compelling arguments against choosing an alternative starting/ending point. Resupplying can be done in Tahoe City, Kings Beach, Stateline, and South Lake Tahoe. The trick, again, is either getting to and from town or finding someone to deliver your resupply. I’m not aware of any businesses that specifically provide resupply options to TRT thru-hikers, but Lake Tahoe is a hiking friendly region, so getting a hitch into and out of town shouldn’t be too difficult. During the summer, most locals are used to seeing PCT and TRT hikers sticking out their thumbs and looking for a ride. How much weight (gear, water, food) should I plan to carry when thru-hiking the Tahoe Rim Trail? What size backpack should I plan to wear? What temperature-rated sleeping bag should I use? What type of shelter should I pack? How much food will I need to carry/eat each day? How much water will I need to carry/drink each day? Do I need to treat each water source? How many times should I plan to resupply? The type and amount of gear you need to carry is highly personal and dependent upon your experience (and wallet). I recommend starting with what you currently own, and then evaluating each piece of gear as you prepare for your journey. Upgrade as needed. Don’t waste a lot of money on buying the latest and greatest until you have a good grip on what your style of backpacking requires. This is something that takes time. If you’re starting from scratch or discover that the nylon panels of your 25-year old backpack are deteriorating, however, you’ll probably need to buy or acquire new gear. There are a couple of different interpretations of what people consider as base weight, but I go with the simplest – base weight is everything you carry that you can’t eat or drink. For example, although a digital camera and journal are considered optional by some people, I will always pack them, they will always be a fixed weight, and I can’t eat them. Therefore, I include them in my base weight. For reference, the average base weight of my summer pack is between 15-20 pounds (depending on specific gear selection for the forecasted weather conditions). I do suffer from gear lust and, as a result, have many options to choose from when packing. Assuming you’re going to be hiking in the summer, plan for lots of sunshine and 70-80 degree temperatures during the day and 30-40 degree temperatures at night. It can get relatively cold at night in Tahoe (especially on mountain peaks), but generally the thermometer doesn’t dip too often too far below freezing during the summer. Dress accordingly. Free-standing shelters, whether they be tents or bivy sacks, afford the most opportunity for camping at night. Tarps and hammocks can be a bit more problematic if there are no trees to be found (which is pretty common throughout various sections of the TRT). Bear proof containers (i.e. canisters) are required by the Forest Service, as well as the Nevada Division of State Parks. You probably won’t actually see any bears, but the containers do an excellent job of preventing small critters from getting your food. Food and water requirements are obviously personal, but on average expect to carry about one pound of food per person per day. I realize this doesn’t sound like a lot of weight. However, if you’re trying to minimize the number of resupplies by carrying more food you may wind up with a hefty pack if you carry for more than 5-7 days. As far as water goes, I’ve never adhered to any formulas for the amount of water I drink. Usually I just drink a bunch of water at the water source (after filtering it) and then fill up a couple of quarts for the trail. One quart of water weighs about 2.2 pounds. Through Desolation Wilderness you may be able to get away with carrying only one quart of water at a time (thanks to all of the lakes). However, as I previously mentioned, there were some 20-mile stretches (along the north and east side of Lake Tahoe) where there were no water sources. If the timing is wrong and you reach that one water source at 10am, you will have to carry water for the rest of the day, that night, and then the following morning (until you reach the next source). Those three to five quarts of water can be heavy on your back. And, yes, you need to filter or treat all of the water you consume on the TRT. Ultra-light backpacks (generally a backpack that, itself, weighs less than three pounds) seldom can bear comfortably more than 30 pounds of total weight. So, if you’re base weight is 20 pounds, you’re carrying food for seven days (7 pounds), and you discover a stretch of trail that you have to carry at least three quarts of water (6.6 pounds), you may exceed the bearing capacity of the ultra-light backpack. You’d probably be able to carry the 33-34 pounds of weight, but the shoulder straps and hip belt might start digging into your flesh and cause you pain. Not a great situation if you have to cover 20 miles until the next water source. Also keep in mind that the amount of food you carry will dictate the size of bear canister you need and the size of bear canister you need will dictate the size of backpack you need. So, if you’re carrying a week’s worth of food (or more), you’re going to need a larger bear canister which means you’ll need a backpack that will accommodate that larger canister. The dimensions of many ultra-light backpacks aren’t necessarily conducive for efficiently carrying the larger varieties of bear canisters. Often you’ll have to sit the canisters upright (versus sideways) which makes packing the rest of your gear challenging. The last point I’d like to make about pack weight dovetails into the aforementioned “worst case” example of having to carry over 30 pounds. Understand that there’s absolutely nothing wrong with acquiring gear that is lighter weight and more compact. However, I do not recommend trying to become an ultra-light backpacker on your first extended backcountry trip. Most ultra-light hikers are very experienced, know exactly how far they can push their bodies under extreme conditions, and know how to pack just enough gear and supplies to get themselves to their next checkpoint. Their primary method of being safe and warm is by being on foot and moving quickly for long durations of time. Their lack of creature comforts and carrying with them only the barest minimum of gear enables them to travel far and fast, but doesn’t usually allow them to hunker down for any long period of time. Also note that the reserve tanks of an experienced ultra-light hiker are usually greater than the max capacity of an average backpacker. And more than anything, if you hop right off of the couch and try to push big miles like an ultra-light hiker (regardless of how little weight you’re carrying) you’re most likely going to wind up with debilitating blisters and tendonitis. How many people thru-hike the Tahoe Rim Trail each year? Does the TRT get crowded like the Pacific Crest Trail or Appalachian Trail? Is there a limit to how big of a group that can hike together? According to the list of the Tahoe Rim Trail Association’s 165-mile club, 747 people successfully completed the Tahoe Rim Trail between the 5-year period of 2013-2017. If you’re curious, you can find me (Jared Manninen; South Lake Tahoe, CA) at #1586 with a completion date of July 9, 2014. Because I can be overzealous with my need for perspective and relevance, let’s do this … Take the total number of hikers (747 hikers) and divide them by the timeframe we’re sampling (5 years), and you get approximately 150 people who complete the TRT each year. Crunching those numbers further, we can take the average number of hikers each year (150) and divide them by the average hiking season (4 months) to arrive at an average number of hikers per month of 38. Lastly, let’s take the average numbers of hikers per month (38) and divide that by the average number of days per month (30) and you get roughly 1-2 hikers per day. Does this mean you’re only going to see one or two other TRT hikers each day? No, but what it illustrates is that you’re probably never going to see too many of them on any given day. In fact, I only met one other thru-hiker during my 10-day trip. I also met a small handful of PCTers while hiking through Desolation Wilderness and a number of day hikers at or around the trailheads, but mostly I was on my own for those ten days. My number crunching does not account for people who don’t register for the 165-mile club (maybe another 10%) or day hikers. It simply puts into perspective what that total number of 747 (from 2013-2017) can mean. Because the TRT travels through various “wilderness” areas, group size is generally limited to 12 people. In my omega man-oriented opinion, though, any group larger than 4-6 people is way too big. Unless you’re a part of a military organization or rescue operation, heading into the backcountry with more than a half dozen people is contrary to why you would want to be in the backcountry in the first place. Are there adequate evacuation routes along the Tahoe Rim Trail in case of emergency? Is there coverage for mobile phones? For better or worse, the Tahoe Rim Trail crosses a number of roads and highways. Look at a topographical map and you’ll notice that those roads look like the spokes of a wheel (with Lake Tahoe being the hub). You’re never more than a couple of days from a major road, and the nearest road will most likely be your evacuation route. Mobile phone reception is generally OK in the Lake Tahoe Basin, but it’s not great. I wouldn’t depend on having phone coverage when you need the most. What permits does a person need to thru-hike the Tahoe Rim Trail? A fire/camp stove permit (free from the Forest Service) is required. This permit is an acknowledgement that you know how to use a camp stove and won’t burn down the forest. There are very few places along the TRT where campfires are permitted and, because I’m wholeheartedly against campfires in the backcountry, I’m not going to list them. My recommendation for you is to extinguish permanently from your mind the idea of building a campfire when you’re backpacking or traveling through the backcountry. Ditch the nostalgia because wildfires are the norm every summer in California. We’re no longer living in the 1970s. Camp stoves and cooking utensils are efficient and easy to use. Down jackets and sleeping bags, Merino wool and synthetic clothing are affordable and effective at keeping you warm. Unless you’re on the verge of death, do not build a campfire in the backcountry. You’ll need an official permit to camp overnight in Desolation Wilderness. This, too, can be acquired from the Forest Service. What type of wildlife will I encounter when hiking the Tahoe Rim Trail (i.e. will I be eaten by a bear)? The biggest predators in the Lake Tahoe Basin are black bears, mountain lions, and bobcats. However, you will seldom, if ever, see any of these four-legged critters. You’re more likely to spot a black bear dumpster diving in town rather than on the trail. Mountain lions and bobcats are elusive and don’t want anything to do with people. Keep your food and chemical scents (sunblock, soap, toothpaste) to a minimum and secure them in a bear canister and you’ll be fine. As far as all of the other critters go, I would pick up a copy of The Laws Field Guide to the Sierra Nevada by John Muir Laws for a comprehensive look at what you may encounter on the trail. The book is a fantastic resource and easy to navigate thanks to its logical organization. I wouldn’t carry it with me on the trail, but take photos and then refer back to the book when trying to identify the flora/fauna in question. I obviously don’t have all of the questions or answers to thru-hiking the Tahoe Rim Trail, but what I’ve listed above gives you a legitimate jumping off point for you to begin your research. And know that every backcountry trip you plan for will have its own unique circumstances and considerations to account for, so begin by listing those questions and then seeking out their answers. If you have specific questions about hiking the TRT, post them in the comment section below and I’ll respond as soon as I can. Then, everyone will benefit from our conversation.